Given someone’s height, I wanted my students to see how well they could predict other measurements (like head circumference, arm span, foot length, and hand length). They used measurement data that they had collected (their very own measurements), and then used scatter plots and lines of best fit for their predictions. We are learning about graphing, including functions and linear equations. They plotted ordered pairs the first day, and then learned about functions. 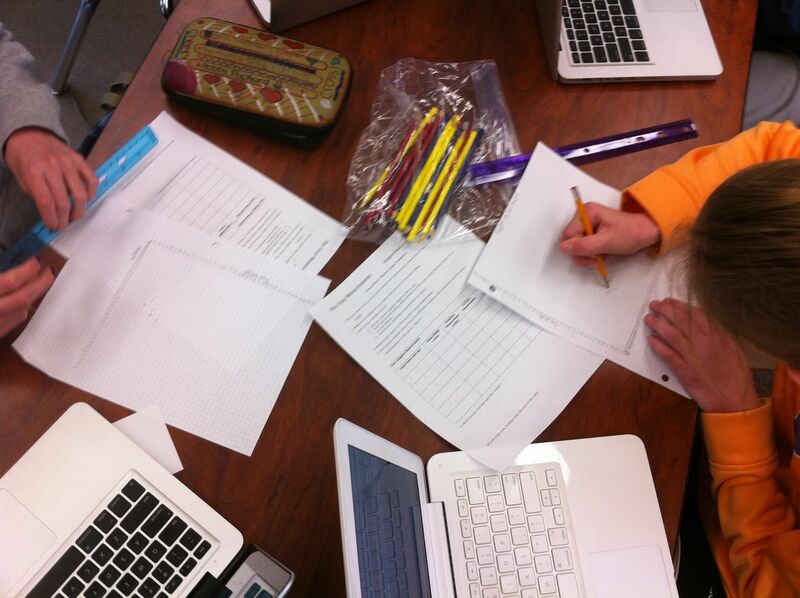 Now it was time to investigate linear equations. This is an amazing part of mathematics not only because it is so interesting, but also because it is useful! I have been told that students grow like weeds in middle school. Since the beginning of the school year, my students have been recording their measurements every couple of months. They measure their height, arm span, head circumference, foot length, and hand length in inches. I had them fill out a Google Docs Survey which then organizes their data into a Google Docs Spreadsheet for us. In class I had the students measure each other again so that recent measurement data could be included in our data set. For homework, they were to enter their measurements onto the survey and measure each member of their families height in inches. At the start of class I gave every student a piece of graph paper, a ruler, a worksheet, and a computer. I then assigned each group a data set to analyze (head, arm span, foot, or hand). We were making all predictions based on height (the x-axis), so everyone kept the height column and one more data set (the y-axis). They duplicated the GDoc data sheet and deleted the columns of data that they were not assigned. 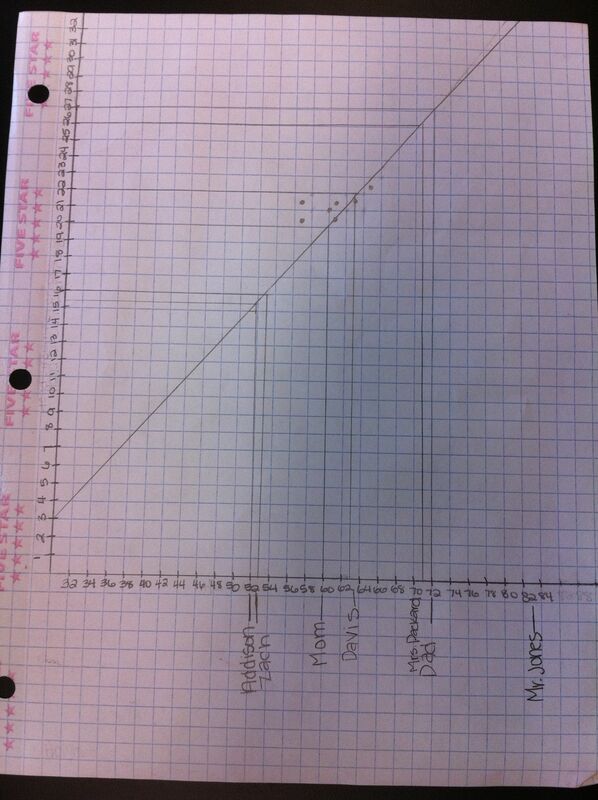 In order to determine the scale for the x-axis and y-axis, they calculated the range for their data sets. This led to a great discussion about how this range would only make a good scale if we were just measuring middle school students. But, we also wanted to be able to predict the measurements of people of other ages and sizes. So, we expanded our range to find a more optimal scale that would cover all of the people that we had measured the night before. We then discussed scale and counted the grid lines on our graph paper to determine how to number our axes. To show them how to make their predictions, I had them fill in the height data that they had collected the night before from members of their family. They plotted their family members height on the x-axis and labeled them. I illustrated how to go up to the line of best fit, then go over to the y-axis to predict their family member’s other measurement. They recorded this and for homework tonight they will find the actual measurements of their family to compare. This was our favorite part! I arranged for 4 – 6 mystery guests to come in at this time. I wanted to measure people of varying heights and ages. Our mystery guests included students (1st graders, a 3rd grader, a 7th grader, some seniors) and teachers from our school. We measured their heights and then predicted their other measurements using the students lines of best fit. While the students worked on their predictions, I had the mystery guests measure each other to find their actual measurements. The guests then walked around the room to see how close the students predictions were. The mystery guest portion was not only the most fun, but also the most informative piece of the lesson. We were able to discuss why some measurements were more accurate than others. They discovered that a big factor overall was that our data came only from middle school aged students. Thus, our data wasn’t as accurate of a predictor for people that weren’t “middle school size”. Also, they determined that some factors were much better predictors overall, such as arm span. For homework, they were to go home and measure their family members actual measurements to see how close their predictions were. I also had the students write a reflection on our class wiki. We had so much fun with this activity but it was a real crunch to get it done in 50 minutes! I will definitely do this again next year, but I will take two full class periods. I would like to go deeper into numbering the axes, spend more time plotting the points, and have more time at the end to analyze the results. Next year we will analyze our data, spend more time plotting points, and then work on our families measurements the first day. Our mystery guests will open day two! From reading the students reflections, it was clear that they really enjoyed this activity too! Win-win! This entry was posted in Activities, Equations, Integrating Technology by I Speak Math. Bookmark the permalink.